On November 7th, I’ll be in Munich for the W-JAX conference where I’ll be giving the talk that my colleague Uwe Friedrichsen and I gave at the JAX conference this April again: Deep Learning - a Primer. Let me know if any of you here are going to be there and would like to meet up! Slides from the original talk can be found here: https://www.slideshare.net/ShirinGlander/deep-learning-a-primer-95197733 Deep Learning is one of the “hot” topics in the AI area – a lot of hype, a lot of inflated expectation, but also quite some impressive success stories. Here I am sharing the slides for a talk that my colleague Uwe Friedrichsen and I gave about Deep Learning - a Primer at the JAX conference on Tuesday, April 24th 2018 in Mainz, Germany. Slides can be found here: https://www.slideshare.net/ShirinGlander/deep-learning-a-primer-95197733 Deep Learning is one of the “hot” topics in the AI area – a lot of hype, a lot of inflated expectation, but also quite some impressive success stories. 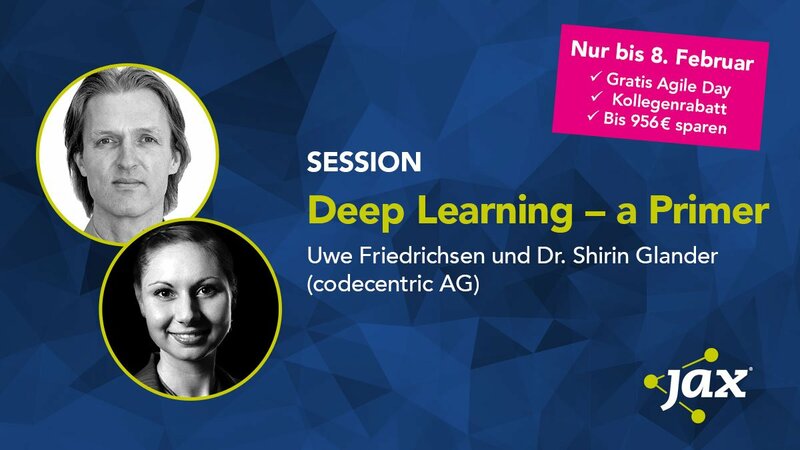 I am happy to announce that on Tuesday, April 24th 2018 Uwe Friedrichsen and I will give a talk about Deep Learning - a Primer at the JAX conference in Mainz, Germany. Deep Learning is one of the “hot” topics in the AI area – a lot of hype, a lot of inflated expectation, but also quite some impressive success stories. As some AI experts already predict that Deep Learning will become “Software 2.